Branca was founded by Aquilino Branca and his team and were based in Buscate on the outskirts of Milan and for some 20 years built a limited number of cars for Formula Junior and F3. The cars were sometimes named Moretti but since there was a Fiat conversion specialist in Turin with the same name, Branca was often used instead. 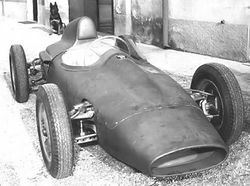 The company first produced an F3 car in 1952 but owing to the popularity of Formula Junior in Italy a change to this formula was quickly adopted with a front-engined Fiat 1100 engine powered chassis. A change to a rear engined car followed but success was limited against the all conquering Stanguellini cars and the later British models. A switch to sports cars was the next chapter of the Branca story and then in 1964 a new F3 on Brabham lines with a Ford engine was introduced with some success. Branca continued intermittently building F3 cars until 1978 when they withdrew from racing.